My Red Velvet Cupcakes are perfect for Valentine’s Day — or any day. They’re easy to make and always a hit. The marshmallow buttercream frosting adds to the decadence which is a must for Valentine’s Day! 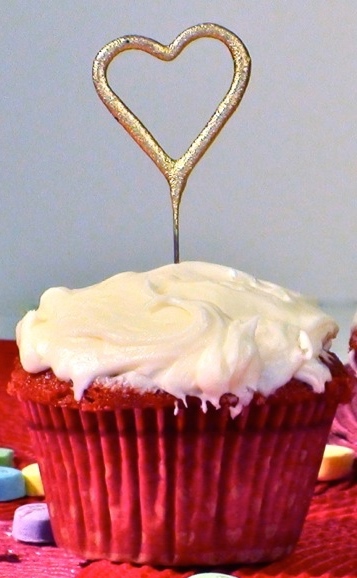 My Red Velvet Cupcakes are perfect for Valentine’s Day — or any day. They’re easy to make and always a hit. Beat butter and sugar in the bowl of a mixer until creamed. Add in vanilla and eggs one at a time and continue to mix. Sift cocoa powder and flour together. With mixer on low, add flour and cocoa mixture and buttermilk, alternating between both until all incorporated. Mix baking soda and vinegar together in a small bowl. Once they react, add into the batter. Add enough red food coloring to get a deep red-colored batter. With an ice-cream scoop, add batter to each cup, fill them about ¾ full. Bake in oven for 25 minutes or until fully done (use a toothpick to test. Cupcakes are done when the toothpick comes out clean). Cool cupcakes on wire cooling rack, store in airtight container once cooled. In the bowl of an electric mixer, combine the envelop of gelatin with 2 1/2 tablespoons of water. Let sit. In a saucepan with lid, combine sugar, 2 1/2 tablespoons water and corn syrup. Cover saucepan and bring to a boil over high heat. Remove lid and swirl. Continue to boil until it reaches 240 degrees on a candy thermometer. Turn mixer on low. With a whisk attachment, slowly pour the hot sugar mixture down the side of the bowl into the gelatin. Increase speed and whisk until the mixture triples in volume. Whisk in the vanilla. Set aside to cool slightly. Change the whisk attachment to a paddle. Add in softened butter and mix to incorporate. Gradually add in the powdered sugar until fully fluffy and combined. Add in the raspberry extract. With a spatula frost each cupcake.